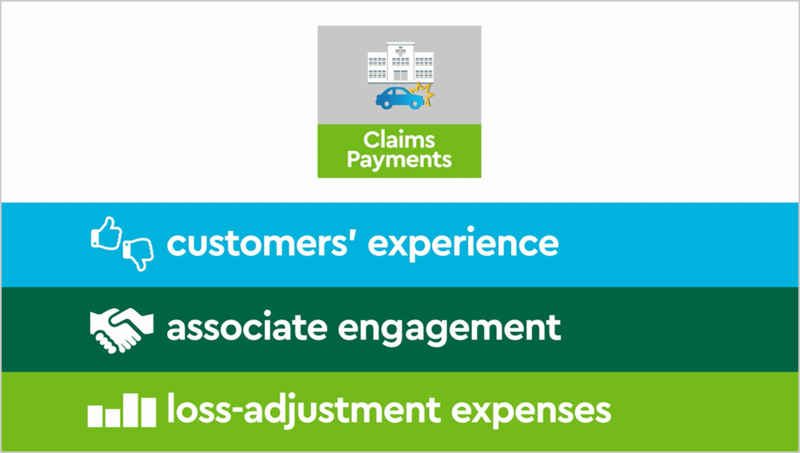 Reinvent the claims payment experience. This is what everyone has been waiting for – a way to provide single and multi-party electronic claims payments while giving insureds faster access to their funds. CommercePayments™ Claims Payments focuses on improving three main areas of your business: the customer experience, your associate engagement and loss adjustment expenses (LAE). Making claims easier for insureds. Convenient Payment Options: Your insureds get paid the way they want to. They can choose the best payment method for their needs from Direct-to-Debit, Direct Deposit, Check, or a Visa Prepaid card. Faster Payment: Electronic payment options put money in the hands of insureds faster than traditional checks. No more waiting on the mail. No more trips to the bank or holds on their funds. Improved Claims Payments Experience: An automated, mobile-friendly portal accommodates active lifestyles while eliminating follow-up with adjusters. Making claims easier for you. Lower LAE & Indemnity Spend: Decrease check costs associated with paper, postage, escheatment, and 1099 processing. Reduce rental days and additional living expenses by providing faster cash in hand. Faster Payment: Get money to your insureds faster by cutting out the time it takes to issue, mail, and deposit checks. Insureds can receive electronic payment in as fast as 30 minutes. Keep Adjusters Happy: The solution doesn’t require your adjusters to change the way they do business. Your adjusters issue payments in your system the way they always have. Plus, insureds’ payment questions will come to us, not you. See how you can start paying out insurance claims digitally while maintaining a relationship with your current bank. Discover what CommercePayments™ can do for your business.